This is part of the CVCe Big CVCe ENDLESS Bundle! 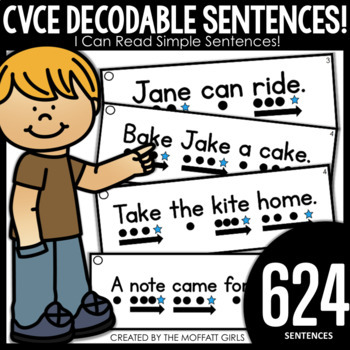 CVCe Decodable Sentences is a simple way to build CVCe fluency and confidence in reading full sentences. 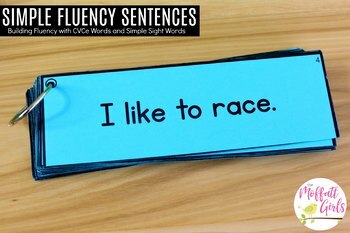 These simple sentences give students the opportunity to practice reading CVCe words along with simple sight words by applying decoding skills of segmenting and blending. There are 624 sentences in this packet. The cards are broken down into 3 sets, with three-word, four-word, and five-word sentences. Each sentence is broken down into CVCe words and basic sight words. The CVCe words have 3 dots and a star to help students segment (isolate) the sounds and an arrow to help students blend (combine) the sounds into a word. 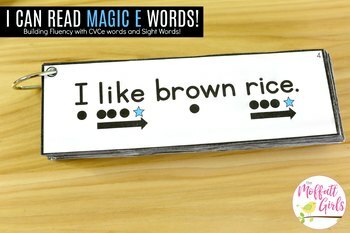 The star indicates that the "magic e" is silent and the vowel is long. The segmenting and blending dots provide beginning readers with the structure and support they need to build confidence and fluency when sounding out words. The sight words have one dot to indicate that these are words that we do NOT sound out, but rather read on demand. Be sure to check out the Big CVC ENDLESS Bundle, too!! 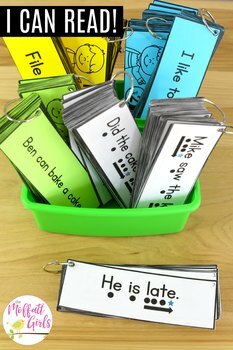 These cards can be used for guided reading warm-ups, small group work, homework, and more!